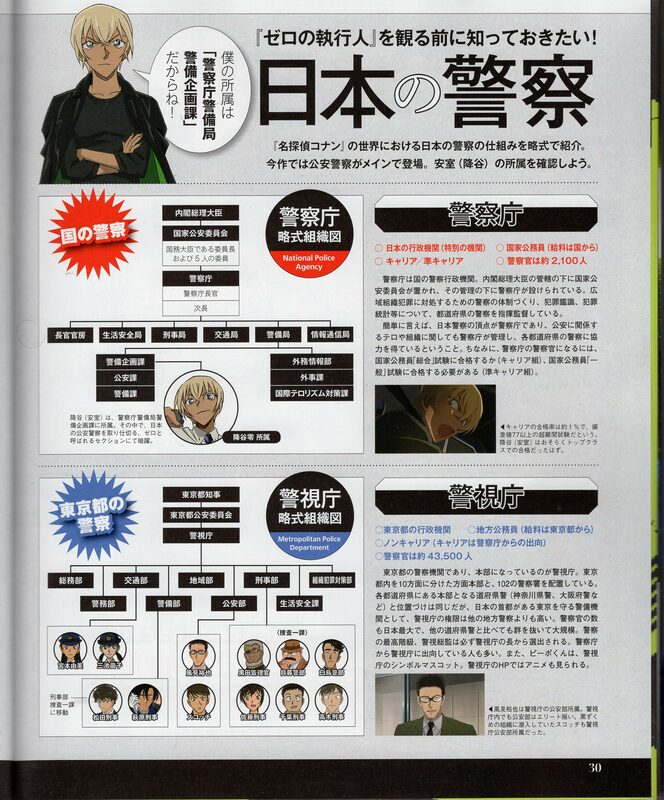 Might someone translate the infos regarding the ?-Person above Amuro in thr last pic? Line: "This is a decision by the Public Safety Department, do you understand?" Supervisor subservient to the Public Safety Police. Supervisor Prosecutor part of the Tokyo Regional Public Prosecutor Office, Public Safety Department. Her subordinate, Kusakabe, in charge of Kogoro's case, suggests her to carry out additional investigation of the case, but Supervisor Iwai dismisses his suggestion. It'd seem she's very subservient to the National Police Agency's Public Safety Police. Line: "Please allow me, Kyouko Tachibana, to defend "the sleeping Kogoro"!" A "cell-lawyer" is a lawyer that doesn't belong to a lawyer agency and take jobs over their cellphones, they're freelance lawyers. She's been in charge of many Public Safety cases in the past but cases with prosecution indictment only have a 0.1% chances of being won so she's lost in all the trials she's been at. She requests to defend Kogoro. Line:"I want you to explain why I wasn't appointed!" Line: "It'd seem that you kept denying the charges in the police." 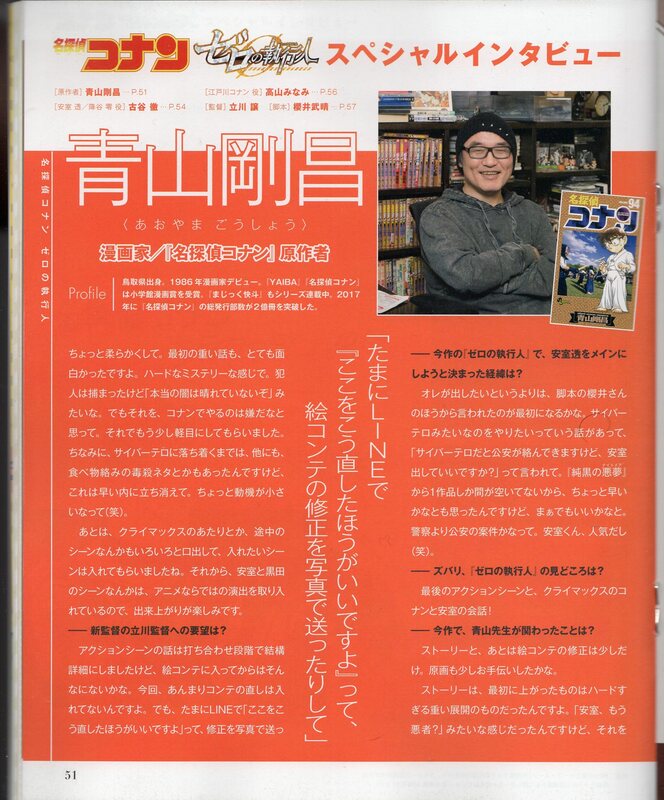 Mangaka / Author of "Detective Conan"
Originary from Tottori Prefecture. Mangaka debut in 1986. "YAIBA" and "Detective Conan" prized with Shogakukan Manga Award. Also serializing the "Magic Kaito" series. In 2017, the total publication amount of "Detective Conan" overcame 200 million units. Q: "How did you decide that Amuro Tooru would be the main character in "Zero the Enforcer", this year's installment?" A: "It all started from a suggestion by Sakurai-san, the scriptwriter, it wasn't my idea. He said he wanted to do a tale about cyber-terrorism and he asked me "if it's cyber-terrorism, then the PSB will get involved, can I make Amuro appear?". It'd only been 1 film since "The Darkest Nightmare" so I did think it was a bit too early to do so but I also though that it would work. Amuro-kun's popular, after all (laughs)." Q: "What are the highlights of this move?" A: "The final action scene, and the talk between Conan and Amuro in the climax!" Q: "In which parts were you involved?" A: "In the story and a bit of storyboard fixes. I also helped a bit with the keyframes. The first version of the story it was very hard and led to heavy happenings. It turned into a "Amuro's become evil?" feeling, so we made it a bit softer. The first heavy story was interesting, too. Had a hard mystery feeling to it. The culprit got caught but "the truth darkness hasn't been dispelled" feeling. But I thought that wasn't something we should in Conan. I also voiced my opinion on the climax and other scenes and had them add scenes I wanted to see. Also, the scene between Amuro and Kuroda, for example, has elements from the anime so I look forward to how it ends up looking." Q: "What were your demands to the new director, Director Tachikawa?" A: "We didn't have too many long phone calls either. Talking over LINE was sufficient (laughs). Q: "What kind of conversation you had with Furuya Tooru-san, Amuro Tooru's VA?" A: "We didn't talk about the movie but I did have a meal with him in the past. Said his daughter is a great fan of Kaitou Kid. Also he did play the role of Tuxedo Mask (Sailor Moon), didn't he? I guess that he probably thinks that I used his character as model to draw Kaitou Kid. But it's actually the inverse, Kaitou Kid came before Tuxedo Mask. 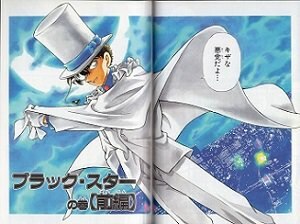 "Magic Kaito" is a old, Showa Period manga. I also told him that Amuro Tooru's true name is Furuya Rei and he replied "Sensei! That's overdoing it!" to which I replied "No, see, the "Rei" is actually "Zero" due to some reasons" and he was like "Huh!?"." Q: "I want to ask about Kazami Yuuya, who's also appeared in the manga. I think that the anime staff decided on his name. He's a subordinate of Amuro so he was Camille. At first he had a long and crumpled hair but I didn't understand what they meant by Camille, so they said "he doesn't look like PSB", and that someone with a bad nature was better. And so his design was remade and ended up like that. I don't watch "Z Gundam" too often. The first [season] of Gundam is the best, in my opinion. Hence why I didn't make the connection. I'm really sorry (laughs)." Q: "I want to ask about Kazami's and Amuro's roles"
A: "To make it clear that Amuro's the great one, Amuro is on the elite section of the NPA, and Kazami belongs to the Police HQ's PSB which is a lower rank. I think Sakurai-san was the one who suggested for Kazami to be older than Amuro. As for Amuro's career, he was in the same class as Matsuda and Date. Scotch also was in the same class. They all died but they were cool types. And Scotch was Amuro's childhood friend. Because, you see, he called him "Zero". And that was nickname of Amuro when he was a kid. I'll have to draw that, indeed." Note 1: "The author of "Sailor Moon" , Takeuchi Naoko-sensei, was told that Tuxedo Mask's model was Kaitou Kid and was glad about it (From the "Aoyama Gosho 30th Anniversary Book"). 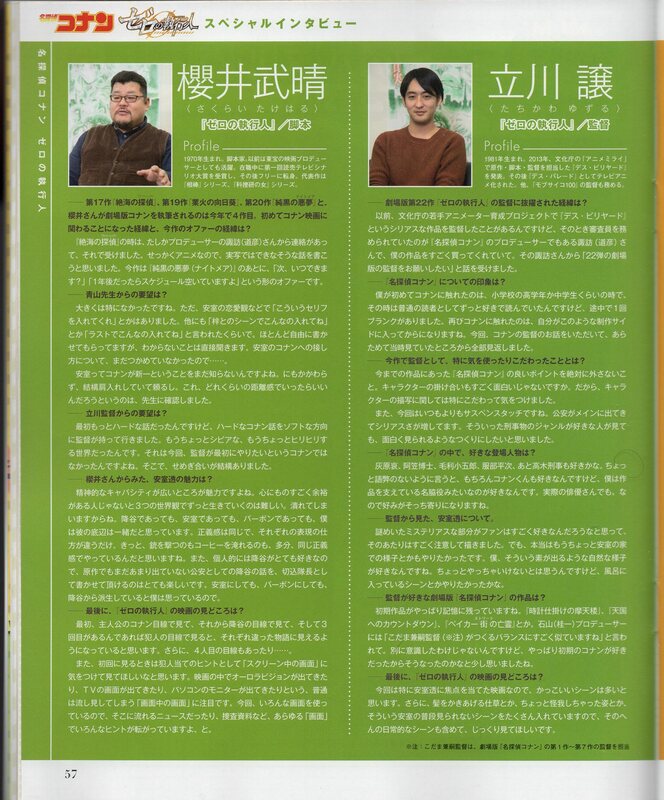 Q: "I wanted to ask about Conan's first spin-off, "Culprit Hanazawa-san"..."
A: "At first, the person in charge showed me the name and asked me "this is the name, will it be OK?". So I replied "Oh, sure. Perfectly OK.". Thought it was fun. I had a meal with Kanba-sensei after that. I told him "feel free to do anything you want to do". Kanba-sensei's hometown is Shimane Prefecture, which is next to Tottori so he's also close to my hometown. The persons who appear are suspicious, Ran-chan's hairstyle, and her horn popping from the middle are fun. I thought it was good to give off a "imposter" feeling. It's pretty good, and fun." Q: "What about your health, and when will [the manga] resume?" A: "Thank you for your concern, I feel very good. I get a feeling of "get to work already!". I think there'll be good news soon enough. I want to write a long story about Detective Chiba and Naeko-chan as well after the manga resumes. With the feeling of "Bayside Shakedown", I'd say. Please look forward to it." Q: "Please give us a message for Conan fans as conclusion of the interview." A: "Both those who know Amuro and those who don't know him... Those who don't know him, they'll know what kind of man he is, and those who know him will get to know him a bit deeper. So please go see the movie. Also, Amuro will be appearing a lot in the manga in the future. Since he was told to "Investigate about Kudo Shinichi", it's inevitable for him to get involved. Look forward to it, too!" 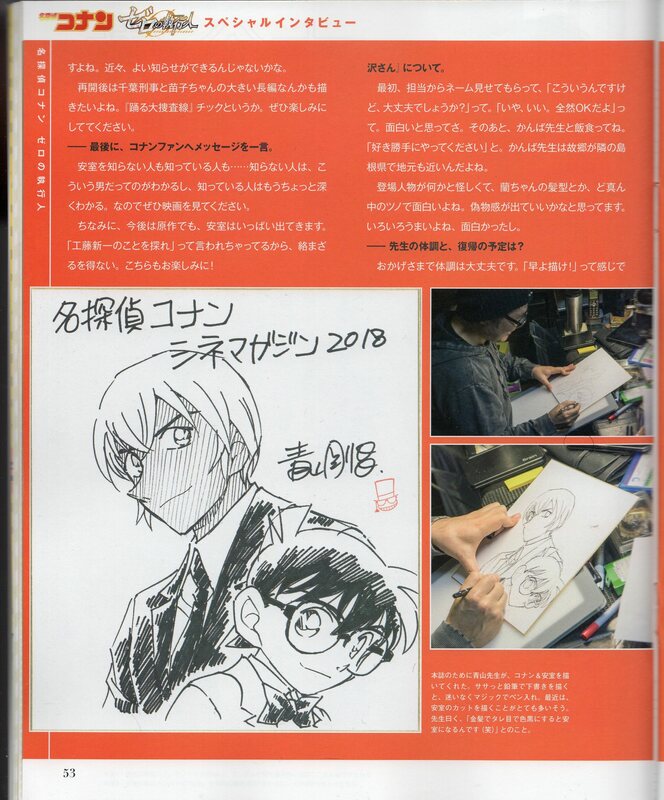 Sign: "Detective Conan Cinema Magazine 2018. Aoyama Gosho." Bottomost right note: "Sensei drew Conan & Amuro for the magazine. He quickly makes a sketch with pencils, and adds a magic pen without any hesitation. It'd seem he's drawing a lot of cuts of Amuro often. He jokingly said "If you make a blonde with squat eyes and dark-skinned there you have Amuro (laughs)"
Originary from Kanazawa Prefecture. His representatives works are "Mobile Suit Gundam" as Amuro Ray, "Star of the Giants" as Hoshi Hyuuma, "Saint Seiya" as Pegasus Seiya, "Dragon Ball" as Yamcha, "Sailor Moon" as Tuxedo Mask amongst others. 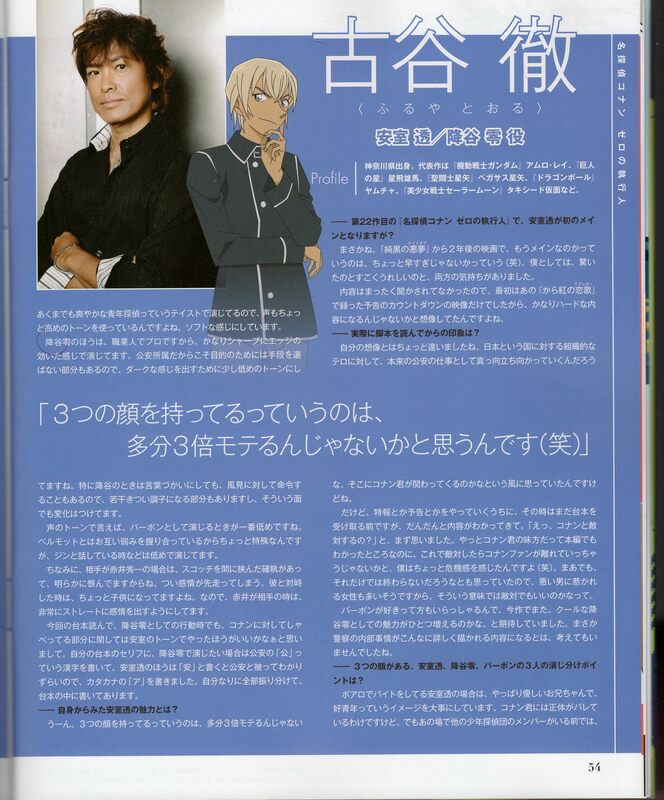 Q: "Will Amuro Tooru, in the 22nd movie "Zero the Enforcer" become a main character?" A: "No way. It's 2 years after "The Darkest Nightmare" so I think it's too early to say that he's become a main character (laughs). Personally, I was very glad and surprised, I have both of those feelings. I didn't know anything about the contents, and at first it was that trailer with the countdown included in "The Crimson Love Letter" so I thought it'd be a movie with hard content." Q: "What's your impression ever since you read the script?" A: "It was a bit different from what I'd imagined. Amuro does his job as PSB officer to face organized terrorism against Japan and heads straight forward. And then Conan-kun would get involved. That's how I thought it'd be like. But as I did the trailers and the teasers, that was before I got the script so I eventually began to understand the contents. I firstly though "Huh? He's going to be enemies with Conan?". Despite that in the main story we finally got to know he was an ally of Conan, so I thought that them being enemies now would draw Conan fans away... I felt a bit of danger, actually (laughs). But I did think that that wouldn't be the end of things, and there women who feel attracted to bad guys so maybe it would be good for them to be enemies when seen from that perspective. There are people who like Bourbon, so I expected that the charm of a cool Furuya Rei would further increase in this movie as well. I didn't think that it'd show details about the state of things within the police, though. 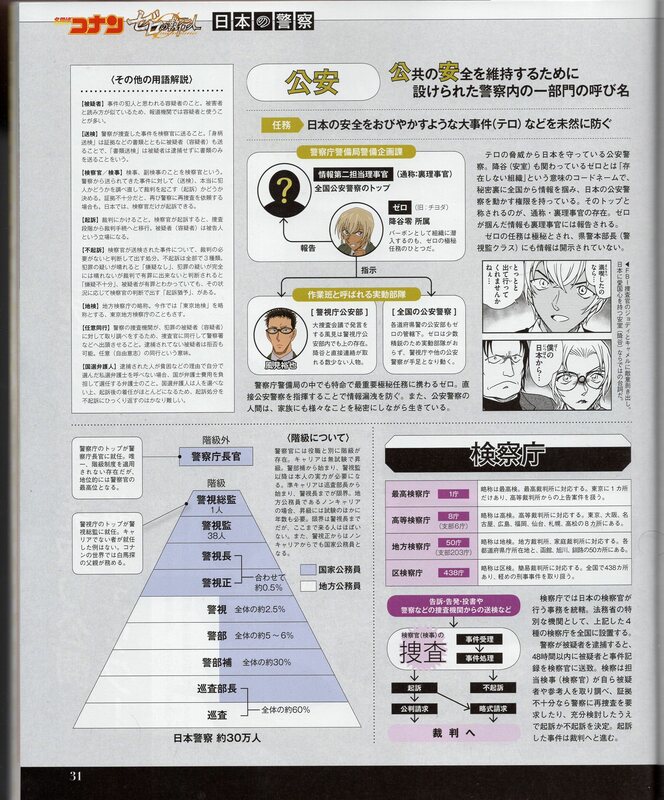 Q: "What points do you have to respectively act his 3 faces of Amuro Tooru, Furuya Rei and Bourbon?" A: "In the case of Amuro Tooru, working at the Poirot part-time, I take into account the image that he behaves like a kind guy and is an attractive young man. Conan knows his identity, but when there are other Detective Boys present, he acts as if he was but a strong and young detective. That's how I voice him like. I use a bit of a higher tone of voice, with a soft feeling. In the case of Furuya Rei, he's a worker and a pro so I voice him in a sharp and edgy manner. To give out a dark feeling I make a lower tone of voice. There also times in which he gives out orders to Kazami, so there are parts in which he turns stricter. I add changes in scenes like those. Speaking of voice tones, I use the lowest one when I voice him as Bourbon. Vermouth and he have a grip of each others' weaknesses so it's a bit special yet when he talks to Gin or similar scenes I use a very low tone. Also, when it comes to Akai Shuichi, he's got a feud with him involving what happened with Scotch so he clearly hates him. His emotions get the best of him. When he faced Akai, he behaves like a kid. So when Akai is around he unusually brings out his emotions in a straightforward way. When reading the movie's script, when he moves around as Furuya Rei, and when he talks to Conan... I thought that it would be better to use Amuro's voice for those scenes. When I had to act scenes as Furuya Rei, I wrote the "Kou" kanji from "kouan (Public Safety)" on my copy of the script and when it was Amuro Tooru I wrote "an". So they overlapped with "kouan" and was hard to understand even for me, so I wrote the katakana "A". I distributed them in the script as much as I could. Q: "What's the charm of Amuro Tooru, in your opinion?" A: "Hmmm... He has 3 faces so I guess he's 3 times more handsome than normal people (laughs). His 3 faces are the first of his charms. So even though I'm acting a single character, I can experience being 3 persons at the same time and acting 3 persons. That's a charm yet it has difficult parts to it so I feel like it's worth doing it. It was fun voicing the 3 of them but I really like Furuya Rei. He feels like a hero of justice. Apart from action, he's also good with his driving technique. He often has cool lines to him, and like in this occasion, I was able to voice him a lot in the movie, since he doesn't appear that often. So I'm very glad at it." Q:"Can you tell us anything that happened during the dubbing?" In the interactions with Conan during the climax has a lot of action so ad-libbing becomes needed and it's hard to coordinate them but when we did the first test we matched things perfectly despite no previous meeting to coordinate things. Our sensibility as voice actors is similar, I guess. Weren't that the case, we wouldn't have been able to synchro the timing so perfectly. I was really surprised. The climax scenes lines were also good, and so the Suzuki Sonoko VA Matsui Naoko-san was very happy at it, and said "Your pierced through my heart!" (laughs)"
I was a bit unsure how to voice Amuro's lines on the movie's climax, and unexpectedly enough, during the tests, I made a strong tone of voice that wasn't what I had on mind, and Naoko-san was very glad so I told my "Oh yeah, this is it" to convince myself it was good enough. I had the feeling to act along with Minami-san and that's the voice that came out during the dubbing. Q: "You've had a long career. 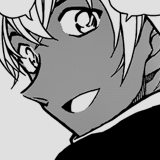 Yet how do you feel about acting a popular character like Amuro Tooru?" A: "I'm really happy at it. I've been a VA for over 50 years, but, for me, it's the first time that a lot of fans had gotten crazy about a character I voiced, crazy over Amuro Tooru. Amuro Ray also has popularity, yeah, but he couldn't beat Char to it (laughs). I often voice the main protagonists of series and so the rival character often gets the attention drawn to him. Nowadays you can see the encouragement through SNS, I like how a lot of followers appear in Twitter, and I'm very surprised at his popularity. Between the Amuro fans, there are some who bought a real white FX-7 (see Note 1). He also makes incredible driving in this film, but whenever the co-stars crash they get severely told "you're wasting the tax money!" (laughs). Q: "Amuro Tooru appeared on Volume 75 of the manga, he appears in the latter half of the story, but were you surprised by the naming at the time of this debut?" A: "We were fans of "Detective Conan" to begin with. My daughter, especially. We often went to the theater to see the movie together. I knew that Ikeda Shuichi-san voiced Akai Shuichi, so I did feel that "the author, Aoyama-sensei, really likes Gundam". I secretly hoped that "maybe one day I'll be offered a role". And when "it finally came" I was "Huh? Amuro Tooru?" when I heard his name. "There's barely any difference (with my name)!". And later, when his real name of Furuya Rei was revealed, I went "Hey, sensei. Didn't you overdo it!?". I did really comment upon those. Around that time I also got a chance to have a lunch with Aoyama-sensei so we brought colored papers and we got each other's signatures, but then... "No, there's a proper meaning to the "Rei" in his name"... That it mean the "Zero" division in the Public Safety Police and things neatly linked together. Q: "Last question. What are the highlights of "Zero The Enforcer"?" A: "In this movie, there's the "way adult men do things" plus "charm" as the themes I acted upon. There are several scenes that make you feel that, so I hope that you will savor them. Anyway, there's "Numbers very dear to me which I must protect even if I bet my life on it" (laughs) so I hope you go to see it several times, and that you fully experience the charm of Amuro Tooru. 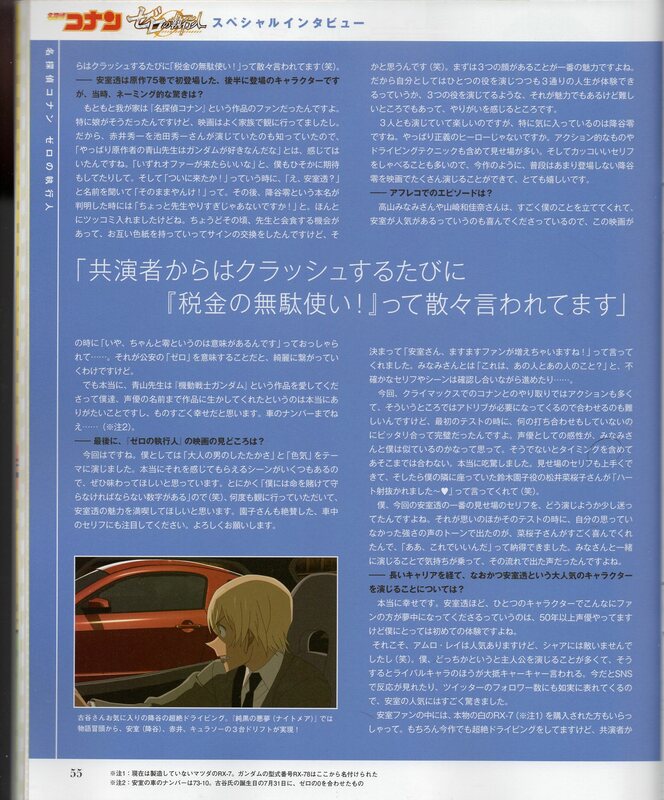 There's also the lines in the car that Sonoko-san accmails as well and which I want you to focus on. Counting on you guys." "Great driving by Furuya (Rei) that Furuya (Tooru) - san likes. In the "Darkest Nightmare" the car drifts in the beginning by Amuro (Furuya), Akai and Curacao are reality!" Note 1: "A Matsuda RX-7 which isn't produced anymore at the present. The serial number of the Gundam, RX-78, comes from here." Note 2: "Amuro's car number plate is 73-10, Mr. Furuya's birthday is July 31, and has a 0 to match the "Zero" nickname. Originary from Tokyo Metropolitan Area. Her representative works are "Kiki's Delivery Service" as Kiki / Ursula, "Rantaro" as Inadera Rantarou, "YAIBA" as Kurogane Yaiba, "Ranma 1/2" as Tendo Nabiki, "Moomin" as Moomintroll amongst others. Q: "What's your first impression of the 22nd Detective Conan Movie, "Zero The Enforcer"?" A: "Good point. When I firstly read the script, I did think "Ah, maybe this story is a bit too complicated". If you see a lot of police dramas like I do, I think one would understand the existence and roles of the "Public Safety Police" and "Prosecution" but for those who don't see them and for children, I was like "would they understand it?". That was my first impression. But by when we finished the dubbing, the impression changed a bit. If you properly listen to what the characters say during the story, I think you'll be able to understand it." Q:"The movie's plot revolves around "Amuro is an enemy?". What did you think about Amuro Tooru or Furuya Rei? What are you impressions of Kazami Yuuya and Kuroda Hyoue?" A: "I did think that I wanted to prove that Amuro-san "isn't the enemy". Kazami-san appeared 2 movies ago, in "The Darkest Nightmare" but in this movie you get to know his relationship in the PSB with Furuya-san. He'll also appeared in the TV series in the future as well, I think. Superintendent Kuroda makes his movie debut in this movie. Whenever he appears in the TV series he's totally suspicious (laughs). He's as suspicious as always, but for some reason he doesn't feel dangerous. He probably is (exposes her deduction) ...or so i think. What I told you is still secret, though (laughs)." Q: "How about the dubbing work?" A: "It went very smoothly, and we finished it on that day. We almost took until past the peak (12:00 AM) but human drama was the axis so we focused on each one's lines and the tempo was good." Q: "How about your work together with Furuya Tooru-san?" A: "We didn't do much consulting about how we would perform the dubbing so but there was a point that Furuy-san asked "it's **, right?". "Yes, I think this is **. ", "Thought so!". That was the confirmation we took with each other. We also check with each other the points that picked us in our lines. Truth is, when I made my debut, since I was playing a boy, I used Furuya-san's acting as a boy as reference. Of course, I can't act like he did but I did wonder what a "boy" is like? So I tried to get the gist from his voice acting. So, secretly, inside of my heart, I thought of him as my "teacher" (laughs). In the dubbing, I am always allowed to practice with my "teacher". He's a big senior with whom I can work very well so it was very fun. Q: "What's your impression of the new Director, Director Tachikawa?" A: "We got friendly very soon and I called him "Tacchi" (laughs). After the dubbing, I asked him "What's the genre you're apt at?". And he replied "I am apt at action, but... I guess human drama is it.". That's shown in this movie, indeed! He's a young director, but he gouges out the deep parts of humans. Since it involves deductions, I think that human dramas are very important. The deduction of the culprit, the actions of the cornered party, must be things that "humans do" or the whole thing will fail. The way the action scenes are scattered is good, but, if you don't properly depict "the human part", the story feels dull... There's been a lot of similar human drama in Conan movies insofar but this time around it felt "really hot". I think this is the director's tastes. I act on it, so you feel that it's a character with "body heat, and feels related to", that's a must have creed. You can hear the heart's sound, they breathe, they're not limited to the 2-d of the screen or the scene, it feels "alive", that's how I like to voice characters. So I like hot dramas like this one." Q: "The identity of "That Person" has been made public in the manga already, yet...?" A: "True. Truth is, during the recording of "The Darkest Nightmare", we casting (about 20 of us, was it?) tried to predict "Who's That Person?". When looking at the answer sheet I'd kept sealed since then, it had an accuracy rate of 25%! It'd seem I checked a lot of things during breaks (laughs). I also showed it to Aoyama-sensei, who'd come to see the dubbing. His reply was "What, they all know who it is!" (laughs). By the way, my answer was wrong. Sensei had let out hints before, and Karasuma Renya's name had considerably popped up but I ended up reading too much into the thing and wrote someone else as my reply to the question." Q: "Last question: what are the movie's highlights?" A: "In this 22nd movie, prosecution, police, and PSP... It's a story in which a lot of words you don't normally hear pop up. Also, in the interactions between characters, there are some crucial points as well so pay close attention and enjoy it until the very end without taking your eyes off the screen. It's a very, very exciting human drama. One last thing to finish, "Amuro-san is someone incredible."." Profile: Born in 1981. He revealed the "Death Billiards" which was his original idea, script and direction at the "Anime Mirai" of the Agency for Cultural Affairs in 2013. It was made into an anime named "Death Parade". He also directed "Mob Psycho 100". Q:"How were you appointed to direct this movie?" 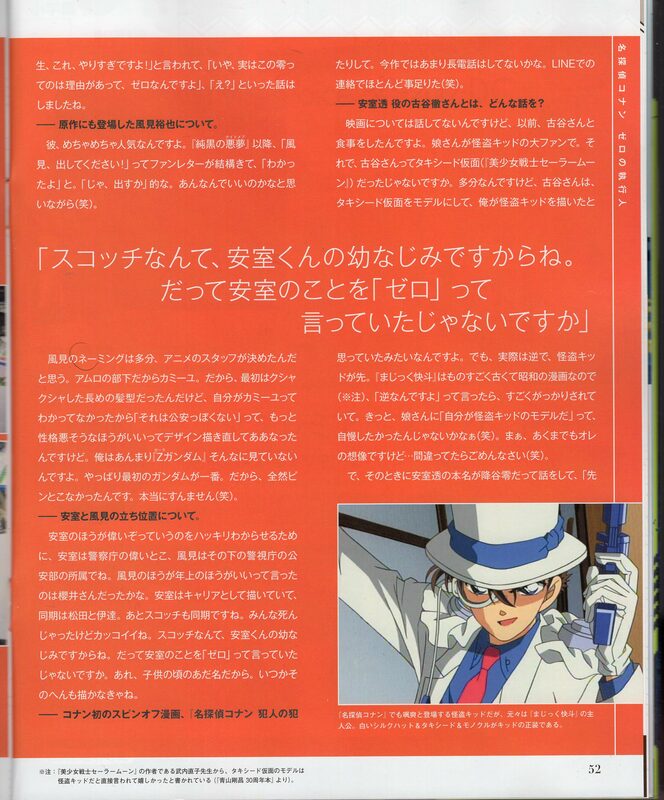 A:"In a raising program from the Agency for Cultural Affairs aimed at young animators I directed a serious film named "Death Billiards" and the judge in charge at the time was the "Detective Conan" Producer, Suwa (Michihiko) - san. He bought a lot of the stuff I made. And he asked me to "Direct the 22nd Movie". " Q: "What's your impression of "Detective Conan"?" A: "I first came into contact with Conan around Elementary... Or High... Or Middle. I loved to read it as a normal reader but there was 1 time I stopped reading. I came into contact with it again once I became a producer. When I got told to be the director of this movie, I re-read again from the part I'd seen years before." Q: "What are the parts you put most detail or attention to as the movie's director?" A: "To not to omit any of the good points that Conan had had insofar. The relations between characters are very interesting. So I took especially care and detail in character depiction. And this movie was more suspense-touch than the usual. The PSB is a main actor and the feeling's more serious. It's made so that if people who like mystery dramas see it then I think they will enjoy it." 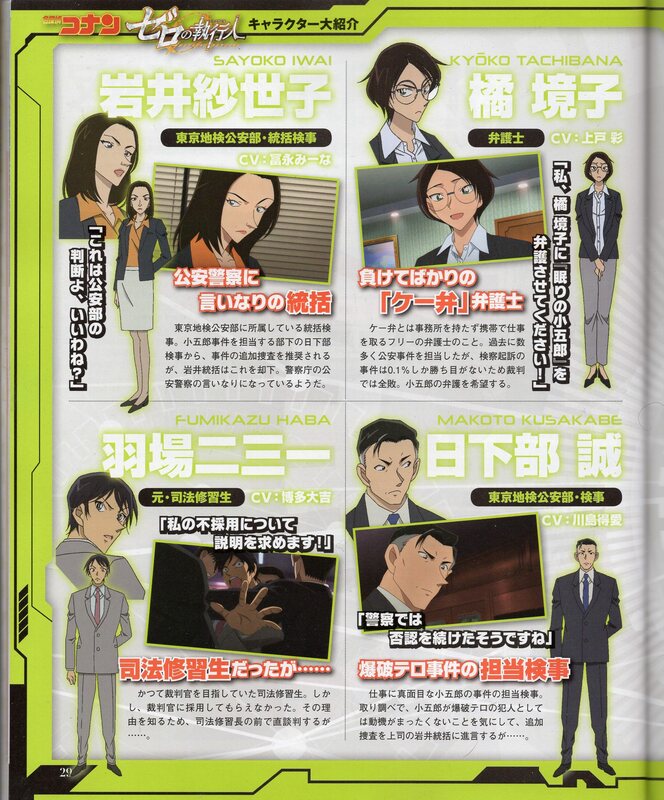 A: "Haibara Ai, Professor Agasa, Mouri Kogoro, Hattori Heiji and Detective Takagi... I'd say. To avoid coming off as faulty, I also like Conan as well. But I rather like the famed side-characters who support the work. As well as the actual actors. So my preferences aim over there." Q: "What's your vision of Amuro Tooru as as director?" A: "I thought that fans would like his mysterious parts so we paid a lot of attention when depicting those. But I also wanted to show Amuro's house as well. I like those parts that reveal one's true nature. I think that it shouldn't be done, but, I also wanted to do a scene of him bathing in the bath." A: "The first films remain in my memory... "The Time-bombed Skyscraper", "Countdown to Heaven", "The Phantom of Baker Street". I was by Producer Ishiyama (Keichi) -san that "it really looks like the balance in Director Kodama Kenji's (see note 1) works". I didn't have it on mind, truth to be told, but I do like the initial Conan so that's why it ended up like that, or so I think. Q: "Last question. What are the highlights of the movie?" A: "This movie mainly focuses on Amuro Tooru so there's a lot of cool scenes. Also, his gestures of combing up his hair or after he gets hurt... There's a lot of scenes showing aspects of him one normally doesn't see. So I hope you have a good look at the film while enjoying those day-to-day scenes." Note 1: "Director Kodama Kenji directed Conan Movie 1 to 7"
Born in 1970. Scriptwriter. He also was a movie producer at Toho. While he was in office, he received the 1st Yomiuri TV Scenario Great Award. He then became a freelancer scriptwriter. His representative works are the "Aibou (Pal)" TV series and the "Forensic Researcher Woman" TV series. Q:"This is the 4th movie the script of which you write up after the 17th movie "Private Eye in the Distant Seas", the 19th movie "Sunflowers of Inferno" and the 20th movie, "The Darkest Nightmare". How did you begin to get involved with Conan and how did you receive the offer for this project?" A: "At the time of "Private Eye in the Distant Seas", I think it was Producer Suwa (Michihiko) -san who contacted me, and I accepted the offer. It was an anime, so I thought of writing a story that couldn't be done in a normal film. After "The Darkest Nightmare", I was asked "When can you make a new script?" and I replied "I'm free in 1 year's time", that was how the offer came. Q: "What are the requests from Aoyama-sensei?" 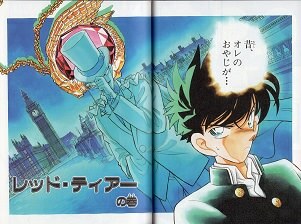 Amuro doesn't yet know that Conan is Shinichi. But despite that, he supports him a lot and relies on him. I wanted to ask Sensei about what kind of distance feeling I should use." Q: "And what were the requests from Director Tachikawa?" A: "It was a harder story at the beginning but he changed it from a hard story to a softer Conan episode. It was a bit more severe and nerve-wrecking world. But that wasn't the first Conan story that the director wanted to do. There were several conflicts with that." Q: "What are Amuro's charms, in your opinion?" A: "He has a wide mental capacity. If it's not someone with a lot of room in their heart then it's hard to live in 3 different world-views. You'll get crushed. Even as Furuya, even as Amuro and even as Bourbon, I think that his base is always the same. His feeling of justice as well, he just changes his form of expressing things. I guess that both shooting a gun and brewing coffee stem from the same feeling of justice. Also, I personally like Furuya a lot, and being chose to, as a charge commander, write a story about Furuya and the PSB which hasn't appeared in the manga often was very exciting. I think it derives from him, even as Amuro, even as Bourbon and eaven as Furuya." Also, when you see it the first time, as a hint to guess the culprit, I wish that you pay attention to the "screen within the screen". A TV screen or a PC screen might appear but pay attention to that "screen within the screen" which one normally oversees. We're using a lot of screens this time, so there might be news announced there or investigation materials, there are hints rolling in several "screens"." Things you want to know before seeing "Zero The Enforcer"! We will introduce the composition of the Japanese Police in the world of "Detective Conan" in a simplified manner. This movie will mainly involve the Public Safety Police. Let's check where Amuro (Furuya) belongs to. Amuro bubble: "I'm affiliated to the National Police Agency's Security Bureau, Security Planning Division", see!" Furuya (Amuro) belongs to the NPA's Security Bureau, Security Planning Division. He's a Japanese Public Safety Police but secretly works in a section named "Zero" behind the scenes. The NPA is the administrative organ of the police. Under the supervision of the Japanese Prime Minister there's the National Public Safety Committee, and the NPA is established under this committee's control. It creates the organization for the police to counter a wide range of organized crimes, and is also in command of each prefecture's police regarding crime examination and criminal statics. To put in simple words, the pinnacle of the Japanese Police is the NPA, and terrorism and organizations which involve the Public Safety are also controlled by the NPA with the cooperation of all prefectural polices. Also, to become an officer in the NPA one must either pass a Government Worker "General "Exam (career bureaucrats) or a Government Worker "Common" Exam (semi-career bureaucrats). Caption: "The Approval Rate of the careers is about 1% with a standard score of over 77. It's a super-hard exam. Furuya (Amuro) probably was a top-class approval case. It's the police organization of the Tokyo Metropolitan Area and the headquarters of it. They split the Tokyo Metropolitan Area in 10 Districts with their District HQs and 102 Police Stations. The prefectural police forces of each prefecture (such as Kanazawa or Osaka) have the same positioning but as the police organization protecting the capital of Japan, the MPD has further authority than other regional police forces. It has the biggest amount of police officers in Japan and it's a big-scale organization and is the best by far when compared to the regional forces. The greatest rank of the police, the Superintendent General of the Metropolitan Police, is always chosen from the chiefs of the MPD. There's also a lot of people who come from the NPA as well. Also, Peep-kun is the the symbol mascot of the MPD. In the MPD's HP one can even see anime. Caption: Kazami Yuuya is affiliated to the MPD's Public Safety Department. This section within the MPD is filled with elites. Scotch, who was undercover in the Black Organization, also belonged to this section. It's the name of a department established within the police to maintain the public safety. The Public Safety Police protecting Japan from terrorist threats. The "Zero" in which Amuro (Furuya) is involved with is a code-name which means "unexisting organization" and secretly acquire information from across the nation, as well as having the authority to mobilize the Japanese Public Safety Police. The "Backstage Administrator" is named as the top of the organization. Information gathered by "Zero" is reported to this figure. The missions of "Zero" are top-secret and Prefectural Police HQ Chiefs (Superintendent Supervisor Class) don't receive this information, either. Top panel, right bubble: "If you've had enough..."
Top panel, left bubble: "How about you get out already..."
Bottom panel: "From my Japan..."
Caption: He openly shows hostility to the FBI Investigators Jodie and Camel. Amuro (Furuya) has patriotism for Japan so they're words typical of him. Kazami, who handles announcements in the great investigation meetings is a hi-ranked member within the MPD's PSD. One of the few who can contact Furuya without intermediaries. The Public Safety Departments of all prefectures are under the administration of "Zero" as well. "Zero" is a small-scale elite unit so it doesn't need a deployment unit, the MPD and other Public Safety Police work as their hands and feet. Even within the NPA's Security Department, "Zero" is given out special orders to engage in out top-secret missions. By directly commanding the Public Safety Police, they prevent information leaking. Also, the Public Safety Police members keep a lot of things secret from their families as they live on. 1) Supreme Public Prosecutor's Office (1 Office): answers to the Supreme Court. There's only 1 in Tokyo and handles appeal cases from the Hi-Rank Courts. 2) Hi-Rank PPO (8 Offices, 6 Branches): answers to Hi-Rank Courts. It has 8 offices: Tokyo, Osaka, Nagoya, Hiroshima, Fukuoka, Sendai, Sapporo , Takamatsu. 3) Regional PPO (50 Offices, 203 Branches): answers to Regional Courts and Domestic Courts. Located in all prefectures, including Hakodate, Asahikawa and Kushiro with a total of 50 Offices. 4) District PPO (438 Officers): they answer to Simple Courts. There's 438 across Japan and handle light criminal cases. The Public Prosecutor's Office supervises the work of the Japanese Prosecutors. As a special organ of the Ministry of Justice, it places the 4 types of Offices listed above across the nation. When the police arrest a suspect, they are sent to the prosecutor along with the case's records within 48 hours. The prosecution is carried by the prosecutor in charge who inquires the suspect and the persons given as references. If there's not enough evidence, they might request a new investigation to the police, or after enough consideration decide whether there's indictment or not. Cases that are indicted proceed to a trial. Apart from their positions, police officers also have ranks. Those with career ascend without any exams. They begin from Assistant Inspector, and all other ranks below Superintendent Supervisor depend on the potential of the person. Those with semi-career begin from Police Sergeant and the max they can aspire to is Chief Superintendent. In the case of non-career persons, who are Regional Government Workers, they must undertake an exam to ascend their rank as well as work for a set number of years. The max they can aspire to is Chief Superintendent, but there's almost no-one who makes it that far. Also, those from Senior Superintendent and above become National Government Workers even if they don't have a career. Note: The NPA's top assumes office as NPA Chief. It's the only person who's not part of the rank system but in terms of position, it's the highest rank a police officer can have. Note: The MPD's top assumed office as Superintendent General of the Metropolitan Police. There are no cases of someone who hasn't had a career assuming office. 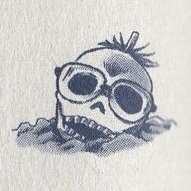 In the world of Conan, Hakuba Saguru's father occupies this rank.
. Suspect (higisha): the suspect (yougisha) believed to be the culprit of the incident / case. Its reading resembles that of higaisha (victim) so information media often use the word yougisha instead.
. Send to prosecutor (souken): the police send the case / incident they've been investigating to the prosecutor. "Person sending (migara souken)" is sending the suspect along with documents or evidence to the prosecutor. "Material sending (shorui souken)" is sending only the materials without arresting the suspect.
. Prosecutor Officer (kensatsukan) / Prosecutor (kenshi): prosecutors and assistant prosecutors (fukukenshi) are named Prosecutor Officers. Regarding the case sent to them by the police (souken) they re-check whether the suspect is the culprit or not and decide whether a trial will be held or not (indictment / kise). If there's not enough evidence they might request the police to carry a new investigation. In Japan, prosecutors can indict people.
. Non-Indictment (fukiso): the measure taken when a case sent to the prosecutor (souken) is deemed to not need a trial. There are 3 types of non-indictment. When the suspicion of a crime is cleared up is "no suspicion (kengi nashi)". When the suspicion of a crime isn't totally cleared up but the trial judges that they can't be declared guilty is "insufficient suspicion (kengi fujuubun). And even if the suspect is known to be guilty, there's the decision by the prosecutor according to the circumstances to do a "indictment postponement (kiso yuuyo)".
. Region Prosecutor (chiken): short for Regional Public Prosecutor's Officer. In the movie, it also serves as shortening for "Tokyo Region Prosecutor" to refer to the Tokyo Region Public Prosecutor's Office.
. Coming voluntarily to be questioned (nini doukou): when police investigation organs carry out inquires of the suspect, and the suspect appears in a police station escorted by a police officer. Suspects which haven't been arrest can reject it. It means to be escorted voluntarily (out of one's free will). - Court-appointed attorney (kokusen bengonin): when someone who's been arrested can't call for a lawyer of their own due to poverty or other reasons, the nation pays the fees of a lawyer and appoints one. These lawyers cannot chose who'll defend so in most cases they're appointed after the suspects are indicted, so it's very hard for them to turn over a indictment processing into a non-indictment. Thanks. Cool that they have police hierarchies at play here.